DAM, Heddon, Creek Chub, Gobel & Ever Ready Lures. About seven years ago when I did my first tackle show in Germany I was introduced to the DAM Vampir lure and straight away I thought that it was a copy of the Heddon Gamefisher. I did wonder why Heddon never took legal action against DAM and I thought what if Heddon made the bait for DAM? (Or visa versa.) After all the Gamefisher had been introduced in 1923 and had US Patent No. 1,477,756 filed in August 1922 covering its design. Over the years I have had many conversations with collectors in Germany and America and the conclusion is that no one knows who made them. My own opinion is that Heddon allowed DAM to produce them. The argument that they were all made by the same company falls down because the German baits have the slotted “V” body whereas the American baits have the inverse “V” body. The illustration right is from the 1936 DAM catalogue and the baits are divided into two types. Those on the left are wobblers with a flatter body and those on the right wobblers with a rounder body. It is the baits on the right that will be concentrating on in this article. Through the years I have continued to look at the illustration of the lures in the 1936, but it was not until that I took a closer look at the rounded wobblers that I noticed even more similarities to American made baits. We can clearly see from the illustration that the top left lure, 3035 the Vampir, (in English Vampire) is very similar to the Heddon Gamefisher. The Gamefisher pictured right shows the inverse “V” style. DAM also made a two section version, just like Heddon. 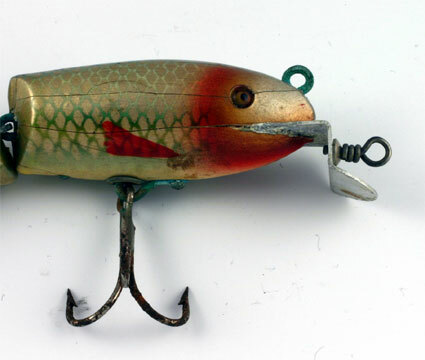 The Heddon bait was sold in eight catalogue colours, Rainbow, White Body Red Head, Green Scale, Pike Scale, Shiner Scale, Orange with Black Spots, Blue Scale and Natural Scale. Many special colours were available. The Vampir was sold in seven colours: White with Red Stripe, White Red and Silver, Blue and Silver, Brown and Gold, Red and Gold, Green and Gold, and Rainbow. The Heddon bait was 4¾ inches long compared with the 5 inches for the DAM bait and this size accounted for the difference in weight. The Heddon Baby Gamefisher was the same size as the small DAM Vampir but the DAM bait was heavier due to the nature of the slotted “V” construction. 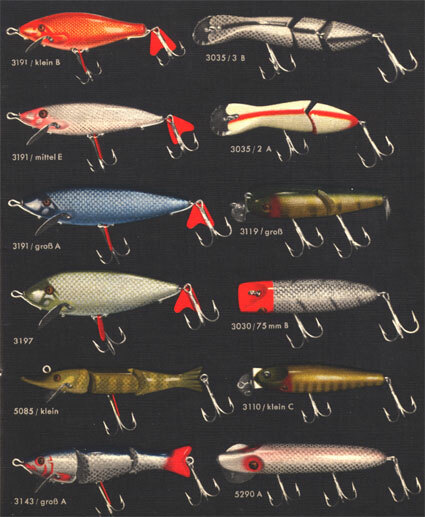 Heddon dropped the Gamefisher from its catalogues in 1934 but DAM continued to produce them. DAM issued catalogue No. 25 in the late 1950’s and the Vampir was included but the company changed the number to model 1656 but dropped the smaller two section bait. The Vampir was now only available in three colours Red with Silver Scale and black back, Blue with Silver Scale and Black Back, and Yellow with Gold and Dark Green Back. The weight had increased from 27 g to 30 g. and the L rig fitted to the pre-war models had been changed to the surface rig. Due to the fact that the company could not issue a new catalogue every year a separate price list was issued. In the 1961 a new catalogue issue number 26 was issued and the Vampir had been dropped. The third lure illustrated is model 3119 and looks to be an exact copy of the Creek Chub Company model 2400 Wigglefish, introduced in 1925. When this lure first turned up some extraordinary prices were paid for them. (At the time was that they were thought to be prototype Creek Chub or Alcott Laight & Westwood manufactured by Creek Chub. The reason was that it was the first time that the Wigglefish had turned up with no markings on the 1920 patented lip and in a different size. The truth is, in my opinion that Creek Chub like Heddon allowed DAM to manufacture the Wigglefish. The bait was made in three sizes but only one colour Perch Scale, and was called the Bass Wobbler. The sizes were 3, 3½ and 4⅜ inches. I believe that Creek Chub supplied the hardware for the baits and also a quantity of baits. The reason for this is that I have seen examples of all three sizes with the slotted “V” body. I also have an example of the standard Creek Chub bait 3½ inches with the inverted “V” body, no marking on the lip and in an Ever Ready box. I will skip the fourth bait and look at the fifth bait model 3110. 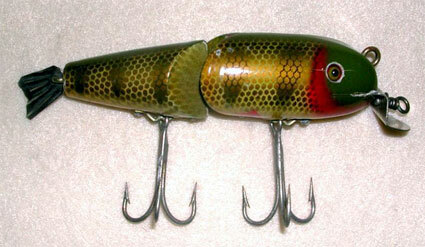 This looks like an exact copy of the Creek Chub Pikie and was called the Pikie Wobbler. 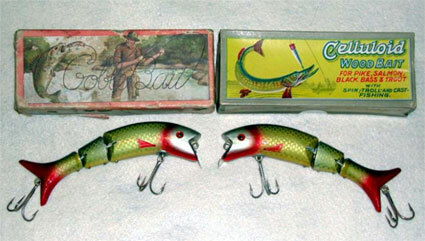 It differed from the Creek Chub model in that the two sizes sold did not match any that the American company made, they were 3½ and 4⅜ inches long. The colours offered were Blue and Silver, Yellow and Gold Scale, Brown and Gold, Green and Brown, White-Red and Silver, and Green and Black (Pike Scale). The bait had the Creek Chub patented lip, double line tie and glass eyes. It did not reappear after 1939. The sixth bait was a copy of the Heddon Vamp model 7500 and was available in the same colours as the Pikie Wobbler. 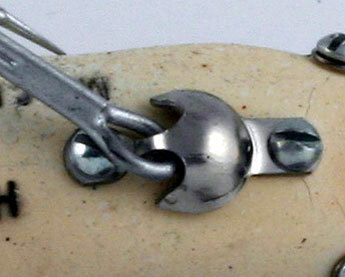 This bait was called the Zyklop (Cyclops in English) Wobbler model 5290. 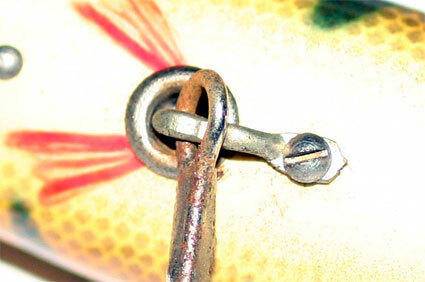 It was introduced in 1936 and like the Heddon model it had a deep diving vane with the hook tie under the chin. It was not listed after 1939. The fourth bait illustrated in the 1936 catalogue was model 3030 Piguin (Penguin in English) Wobbler. Sold in four sizes 1¼, 1¾, 2¼ and 3½ inches and looks to be a copy of the South Bend Bass Oreno. The catalogue states that the shape of the lure was a well established pattern with a zigzag motion. Only one size compared exactly with the South Bends lure and I believe that theses baits were manufactured by DAM with no need to seek approval from the American company. They were available in seven colours White and Red, White Red and Silver, Yellow and Orange, Yellow and Red Spotted, Green and Gold, Yellow with Red Spots and Dark Rib, and Luminous for night fishing. This particular bait was the one that lead me to draw certain conclusions regarding a few mysteries that needed clearing up. I would ask you to bear with me while I explain the detective trail. The Celluloid Wood Bait shown has the Pinguin Wobbler in it. If we look at the other boxed Celluloid bait we see a two section Wobbler. Look at the Pike on the box top of the Celluloid bait and then look at the Pike on the box top of the Ever Ready bait. Same artist? A pair of Tulsa Wobblers from the collection of Ron Handley in Goble & Celluloid boxes. We then take it a little further and we see another Celluloid boxed bait from the collection of Ron Handley. Placed alongside this we see a Goble boxed bait and it is exactly the same bait as the Celluloid one. Two section Wobbler in a Celluloid box. Look at the two section bait, again this has the Creek Chub diving lip and two line attachment points. What makes this bait different from other is that it has the carved tail. Creek Chub lip detail on the two section Celluloid Wobbler. 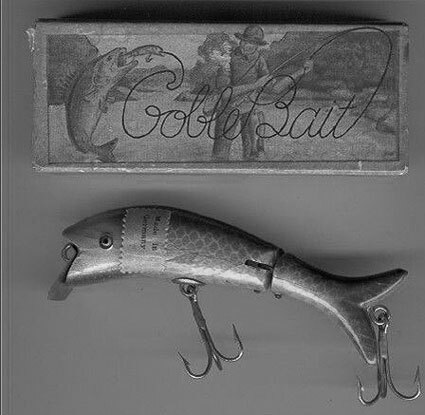 Look also at the picture of the Goble bait sold on eBay last year. We can clearly see a sticker MADE IN GERMANY. What’s going on? Two section bait in Goble box with MADE IN GERMANY sticker, sold on eBay. Well the Goble bait company of Tulsa Oklahoma took out US patent 1,487,556 in 1922 for a two section bait. As far as I am aware this bait has never been found. Either it proved to be too expensive to make or it did not work. What the company need was as bait to sell. Bert Goble did import baits and he went to DAM for his source. We will return to this subject in a future issue. This entry was posted in Creek Chub, D.A.M German tackle maker, Ever Ready German tackle maker., Gobel Bait., Heddon. Bookmark the permalink. 9 Responses to DAM, Heddon, Creek Chub, Gobel & Ever Ready Lures. I am having trouble finding much information on collecting values of DAM fishing lures. I would appreciate a good source. Thanks. Sir I have different types of the Vampir lure in my possession… Both with the slotted “V” body and the inverse “V” body…as it was done on the Gamefisher… I even have a picture from a 1933 Dam catalogue (kindly send to me by German bait collector Mr. Thomas Kalweit) showing the Dam Vampir with the inverse “V” body… So the Dam Vampir… came in both versions.. I am sorry that I was not able to upload a scan of the 1933 Dam catalogue page..
Help! An Allcott Laight and Westwood (Toronto) bamboo fly rod purchased just after WW 2. There is a number on it…4884. How could I find out the value of the rod…unused…in metal case and fabric sleeve inside case. Any thoughts? I have a wooden vampire fishing lure in mint condition around 1923-1925 wondering what it is worth? I have a Dam Gerat Damyl 3 piece bamboo fly fishing rod and was looking to find out when it was made and what it’s value might be. Please e-mail me if you have any information to share. I have a lure that I would like to know more about, it has the name ‘cyclops’ on the bottom in boxed letters like Hedden uses. It also has only one eye in the middle of its face, its lipless like a spot lure. Can you help me, please? do you have any idea, where I can buy DAM Pikie with three hooks, colour A acc. 1933 years catalog?